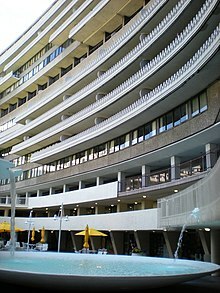 The Watergate apartment building where the crime took place. The Watergate scandal was a scandal during and after the 1972 Presidential Election. United States President and Republican Richard Nixon was running for election against Democrat George McGovern. A janitor discovered clues that former FBI and CIA agents broke into the offices of the Democratic Party and George McGovern months before the election. These people listened to phone lines and secret papers were stolen. This was against the law. When these men were found, it turned out that Nixon was involved, helped them cover it all up and might have even paid for it to happen. The Washington Post was a newspaper which played a huge role in exposing the misdoings, specifically reporters Bob Woodward and Carl Bernstein. Nixon chose to resign from presidency on August 9, 1974 because he did not want to be impeached (this means that he may be charged with crimes). So, the U.S. Congress could not impeach him. After this, Gerald Ford, his vice-president, became the President. Ford later forgave and pardoned Nixon for all of his crimes. The name "Watergate" comes from the hotel in Washington, D.C. where the first crime took place and is often associated with political scandals.